Rose bay, 121.5 cms, foaled 1991. Dam Shilstone Rocks Country Bunch. An active mover with plenty of bone North Countryman was exported as a foal to Sweden where he was a very successful sire, also a winner of dressage and other competitions under saddle… Having seen a photo of him and his stock we decided he should come back to us. He excelled himself under saddle produced by the Harrison Team and ridden by Debbie. What a wonderful job they did, having won countless championships and qualified him for HOYS where he was placed 2nd.2005 & 2006. Best of Breed at Olympia 2006. Sire of winning stock at county level. Dark brown, 121.5 cms, foaled 2003. Dunnabrook was shown four times as a yearling, with outstanding success and was unbeaten – Res Ch home bred Bath & West. Res Ch Male & Res Ch youngstock Northern Dartmoor. Res Ch yearling Southern Dartmoor. Dunnabrook was produced under saddle by the Harrison team when he was fifth at HOYS. During the last two years he was ridden and produced by Carla Fall who qualified him twice for HOYS. He has now retired from ridden work and will remain at stud with us. He is a truly rugged pony of old fashioned type, but still has quality and a very attractive head. With new bloodlines on his female side he is a great asset to our stud and, even though he has spent the greater part of his life being ridden, he is the sire of several top class youngsters who are winning at county level and he became a super premium stallion last year. Among them are: – Shilstone Rocks Cottage Craft, Supreme Champion at the Dartmoor Pony Society Championship show. Shilstone Rocks Navarra, born 2011. (In our ownership he won two yearling championships one Reserve supreme championship and Champion yearling and Reserve champion youngstock DPS breed show.) Now owned by the Newoak stud. Shilstone Rocks Maverick. Born 2013 Four firsts at county level and Reserve champion at Okehampton. Dam Shilstone Rocks Drizzle (Supreme Champion at the DPS Annual Breed Show, her one and only show). Only lightly used as we have so many closely related to him. 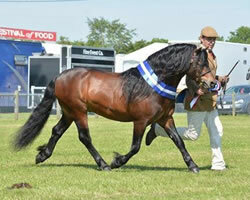 Among his winners are Champion Shilstone Rocks River Ripple HOYS 2009, Shilstone Headland Warren who was 1st Devon County and Champion Yearling Northern Dartmoor Show and Supreme Champion at the Duchy Moorland Show. Also sire of the winning Dartmoor colt Wistmans Cenotaph. A winner of many championships, including qualifying for the Picton finals where he was champion 2006. In 2008 he was 4th at HOYS ridden by Chloe Chub and in 2009 he qualified for Olympia. Produced by the Harrison Team. Sire of winning stock at county level among whom is Shilstone Rocks Snowy River owned by Sophie Acton. We are expecting the first foals by this promising young stallion this spring. He is unshown to date. Loaned to the Newtake Scheme 1010, 2011 & 2012 & 13 Sire of top class Dartmoor’s with quality and good bone.Stallion of the Year 2000. Warlord has excelled in the show ring both under saddle and in hand. He has won 6 major championships in hand. His only season under saddle ridden by the Barton/Harrison team he won 14 firsts, 2 reserve championships both in flat and W.H.P. At H.O.Y.S. he was 3rd in the working hunter pony. He has also won a large dressage class. Warlord has sired a number of first prize winners and Champions including Mare of the Year 2004, Supreme Champion Shilstone Rocks Masora and Supreme Champion Shilstone Rocks Another Star. Siring big stock with ability to jump and plenty of bone. Now under the owner ship of David Hodge, Blackertor Stud. Successfully shown in-hand and under saddle. Champion at Picton finals 2013 NPS Championship show. Like all Shilstone Rocks ponies, his temperament is proving to be second to none. Now owned by Laura Allingham, who has had a very successful year with him under saddle. Rose Bay, 11.3hh, Foaled 1980, Died 2007. Sire of the Year 1997, 2nd 1998, tied 1st 1999, 1st in 2000 and winner of The Cherry Progeny Trophy. Sire of The Year, again in 2004, Reserve in 2006. D-Day is the sire of top show winners having sired 19 star show first prize winners. At the time of his death only one other living stallion had sired more. D-Day had the most amazing temperament, which his progeny have inherited. Dam Shilstone Rocks Rainy Day. Sire of many well known winning stock mainly with the New Oak prefix. Owned in partnership with Mrs. J Moore. This superb stallion needs little introduction, he flew the flag for Dartmoor Ponies in ridden classes for many years at both HOYS and Olympia. 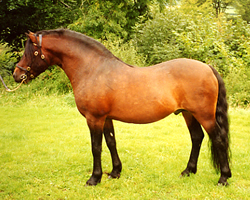 He has also been a wonderful and much loved childs pony and a sire of top quality stock. Owner Lynda Calcutt. This outstanding young stallion has a long way to go. He has already been to HOYS where he was 6th among many other top results in-hand and ridden. Owned by Anna Ullabrita Ideryd Sweden.